Rakusan did not include the Fan Series in his main sequence numbering. Therefore, the original number used for each of the 36 Series prints has been modified to identify the Fan Series members of its theme. The five different fan silhouette shapes have been here assigned arbitrary numbers 1 through 5. To indicate a fan design these shape designations are added to the 36 Series number separated by a hyphen. 125-1 is the Fan Series design with fan shape 1 in the 125 Pussywillow theme. Like all other designs in this series, 125-1 was only produced in a single print run, and few copies are currently documented. All five fan designs (including 125-1) have seal C, which indicates a carving date during the first half of 1934. Despite the early completion of those wooden blocks, Rakusan delayed printing and distribution of the prints in what became the 125 Pussywillow theme at least for several months. It was eventually grouped with other winter season themes nearer to the end of the series. However, the 36 Series design 125 has seal B which indicates a later carving period closer to the time of publication. The composition of 125-1 includes several branches of pussywillow, some of which are emerging from the water of a small lake or stream. The water level (indicated by wavy lines) was apparently previously higher as though in winter flood. A considerable amount of floating debris has become lodged in the pussywillow branches above the current water level. 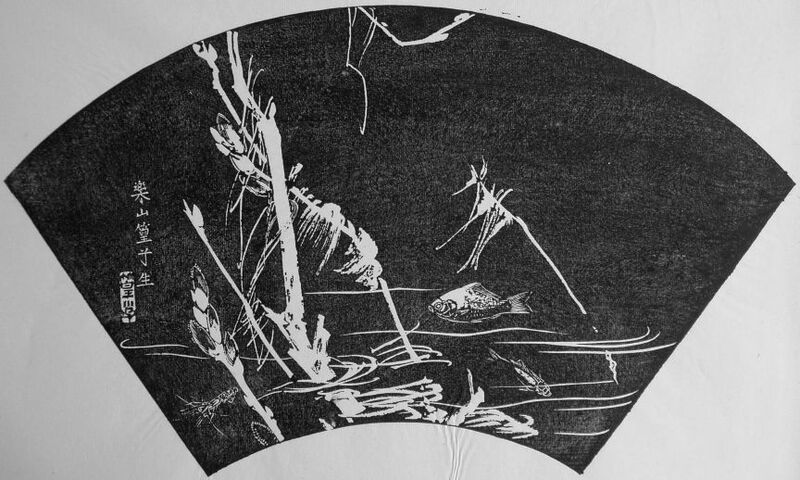 Swimming in the water at right are two crucian carp, and at left a small freshwater shrimp. 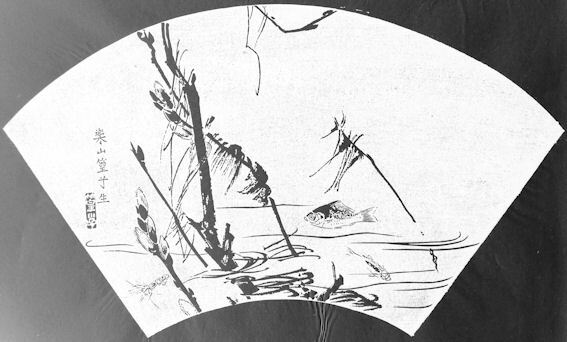 The entire composition is painstakingly carved so that the ishizuri version is an exact negative of the original sketch. Note that this is the only design in this theme which does not have snow or ice. The small freshwater shrimp at lower left is probably Lake Prawn, Palaemon paucidens, 条蝦, 条蝦, スジエビ, suji-ebi, lit. 'striped shrimp', is an edible species found locally near Kyoto, especially in Lake Biwa. The same variety of shrimp is shown in 127-4 and possibly also in 108-5.